There has been something of a heat wave this summer, and whenever the sun comes out we can be sure that we will get a deluge of two-seater sports cars. And of course, some of them will require buffing to bring them up to full potential. (We actually recommend that you get your sports cars done over the winter so they are ready for the summer). The first car we had for the Buffmeister to do this summer was a blue Honda NSX. We started off with a full inspection out in the car park in the bright sunlight. What we found were the usual swirl marks that you would expect to see on most cars in bright sunlight. I'm really going off the term 'swirl marks' as it seems to get used for every kind of micro scratch damage. Another term often used for the kind of damage seen on this car is 'Spider webs'. When you look at these pictures you can see where the expression comes from. 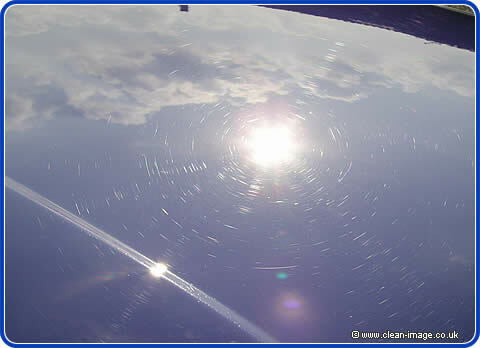 It's a radiating pattern caused by bright sun light reflecting off the sharp edges of tiny scratches all over the paintwork. 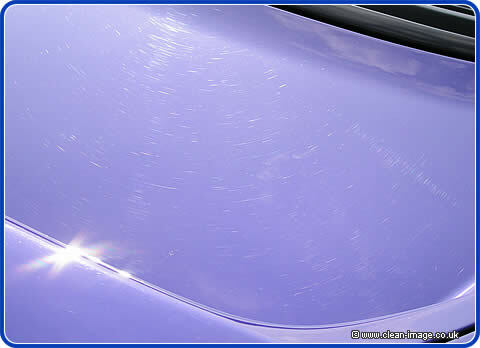 These scratches are mostly caused when the car is washed, the car gets covered in dust and grit and as you wash the car down with a sponge you are rubbing this grit against the car. In fact washing products which are too harsh can also cause damage such as brushes that attach to your hosepipe. It's all due to changes in the kind of paint manufacturers have used over the years. Back in the good old days cellulose paint was very tough, but as they have switched to less harmful and more environmentally friendly paints they have gotten much, much softer -- to the point that we have found that our ultra soft microfibre cloths can leave marks on some cars. If you ever brush against your car then there is a very good chance your clothing will cause scratches and if the car is covered in grit and dirt at the time these scratches will be worse. 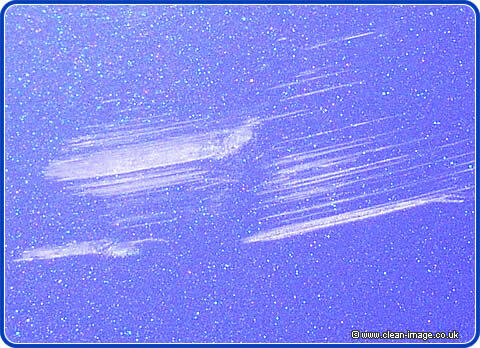 Most people live with these micro scratches, after all it's almost impossible to keep your car scratch free, and you really only ever see them when the sun is directly on them -- which isn't all that often in this country! Many car waxes now contain fillers and diffusers to reduce their effect making them far harder to see, but for some people who own prestige cars, they wish to get a glossy mirror like finish. This car also had one or two light scuffs and deeper scratches such as the one pictured above. They were deep enough to be seen from any angle (not just in bright sunlight) but light enough that we could buff them out. (see diagram here). Special Offer - We'll make you famous! We need your help to write one of our famous articles. We want to prove that paint correction is worth every penny, so we are looking for a couple of people to get their cars valued before they bring them to us for paintwork correction. And then, once we have made you car look super wonderful, if you get another valuation and bring it to us, and let us feature you in an article, we will give you £200 cash back. So not only will you and your car feature in one of our much read articles, you'll even get paid for it. 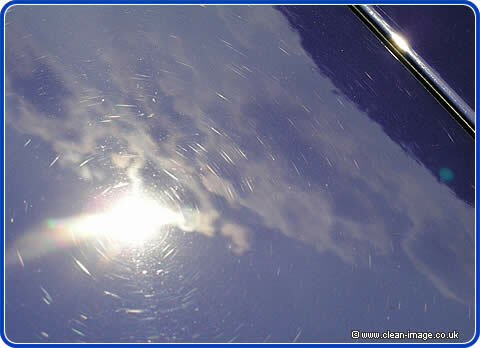 To find out more about our paint correction services click here. © 2003-2012 www.clean-image.co.uk car valeting, auto detailing, car care, & smart repair.